Between January and May 2012, Hubei provincial Institute of Cultural Heritage and Archaeology has investigated and, as a means of rescue, excavated four tombs (M4, M5, M6, and M7) in the vicinity of Wenfengta. The date of the site was roughly set between late Spring & Autumn Period and Ming-Qing Dynasties. In June 2012, the Institute expanded the surveys around the site and, after Preliminary investigations, the team found more than sixty burials under the civilian houses. Authorized by the State Administration of Cultural Heritage (SACH), the Institute initiated a full-scale excavation project; all the tombs investigated earlier in the area have been excavated between September 2012 and January 2013. Sixty-six tombs have been unearthed. Among them, fifty-four are earthen-pit tombs, twelve are brick-chambered, two are pits of chariots and horses, and one pit of horses. Some of the tombs broke through each other. The earthen pit tombs are either rectangular or square in shape; most of them lie from east to west, with only a few south-to-north exceptions. Based on scale the tombs can be classified into small-, medium- and large-sized. Among them, seven are large-sized (with length over five meters), eight are medium-sized (with length around four meters), and the rest are all small-sized. The fillings are all yellow-red variegated soil, hardened, but with no trace of rammed. All the large-sized tombs were raided earlier, leaving behind only a handful of antiques. Most small-sized tombs, however, never suffered grave-looting, and that means better and more antiques. Among those excavated earthen pit tombs, three large-sized tombs have waist pits, inside which dogs or pottery pots have been buried. Wooden coffins exist in all earthen pit tombs, but most are rather decayed. Judging from traces left by rotten and a few intact coffins, there should be four types in total: three coffins with one outer coffin (“guo”), two coffins with one outer coffin, one coffin plus one outer coffin, and single coffin. On the surface of the lids of some rotten coffins, traces of decoration are still recognizable. Cinnabar clay has also been found inside most coffins. Human skeletons are poorly preserved; the dead are supine with extended limbs and head pointing towards east. Among the excavated tombs, M18 is the largest. There are three robber holes in total. The grave is “亚”-shaped in plane, with a rectangular passage in the south end. The remaining of the passage is 6.6 meters long with fifteen steps. The entrance is about 16.6 meters (south-north) times 15.6 meters (east-west), and nine meters in depth. The whole grave is surrounded by three steps. It contains three coffins and one outer coffin, all made of wood. “中”-shaped, the outer coffin chamber is divided into five rooms (Eastern, Southern, Western, Northern, and Middle), with the main coffin chamber in the middle. Since the tomb has been raided before, it produces only a limited number of grave goods. There is no trace of human skeleton and grave goods inside the coffin either, so there is no way of knowing the burial customs. The only chamber intact is the eastern room, from which over seventy pieces of bronze wares, including ding tripods, gui containers, fu containers (food container, always used in ritual ceremonies), li tripods, jian water containers, and square hu (wine containers). Under the outer coffin, there are ten pieces of timbers, arranged in the shape of “井”. A round waist pit is discovered under the timbers, it locates in the north by the middle and is 0.5 meter deep. Its mouth is 0.5 meter in diameter, and the bottom 0.4 meter in diameter. There is a pottery pot in the bottom. In each of the eastern, western, and northern sides of the tomb, there is a funerary pit for grave goods. The pits are 2 meters by 2 meters, and 7.6 meters in depth. Only one pottery pot has been discovered in the eastern pit, and two bronze square fou containers in the northern one; but the western pit produces nothing. The passage of the tomb breaks into another tomb (M69) which lies from west to east. Judging from the forms of the grave goods and its overlapped relationship, M18 should be dated to mid Warring States period. In addition to the above-mentioned tombs, the team also unearthed two pits of chariots and horses and one pit of horses. But neither of them is well preserved; all the chariots are of two wheels and one shaft, and buried in completed form. Pit one contains a two-horse chariot and, judging from its location, it should be a part of tomb M43; pit two shelters a four-horse chariot and should be attached to tomb M29. The pit of horses produces remains of eight horses. With no corresponding tomb in the vicinity, it is not possible to identity its host tomb. It might be a sacrificial pit for the entire cemetery. In addition to the above-said earthen pit tombs, twelve brick-chambered tombs have been excavated. All of them are classified as small-sized and poorly preserved; they have all suffered grave robbery in the past. No dome has been found; in some cases, only the bottom remains intact. Most produces no grave goods. Only one dates back to Eastern Han period, and contains a handful of porcelains. The rest are all from Song, Ming and Qing dynasties. Grave goods from this excavation are made of bronze, pottery, porcelain, lacquer, bones, leather, and jade etc. Their number amounts to 1027. Most of them come from small- and middle-scaled tombs. Among them, 557 are bronze wares, including ding tripods, gui containers, fu containers, square hu (wine containers), fou containers, yan (cooking wares), jian water containers, plates, yi water containers, and so on. Some of them are inscribed with “Zeng”, “Zengzi” (song of Zeng), “zenggongzi” (Prince Zeng) and “zengsun” (grandson of Zeng), etc.. Based on the inscriptions, most of the earthen pit tombs belong to Zeng State. As for the pottery wares, all of them are broken and dominated by pottery ceremonial wares in imitation of bronze, including ding tripods, gui containers, fu containers, plates, and yi water containers, etc.. According to their shape, they should belong to Eastern Zhou period. Therefore most of them is chiefly an aristocratic cemetery of Zeng state, dating back to mid-late Spring and Autumn period. 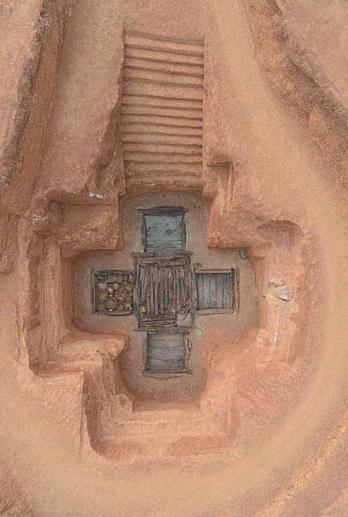 Moreover, the team also discovered some tombs of Chu State, dating to late Warring States period. So the dating of the cemetery stretches from mid Spring and Autumn period to the Warring States period, with a few belong to Chu State of late Warring States period. The excavation project produces many artifacts, which have great academic values. 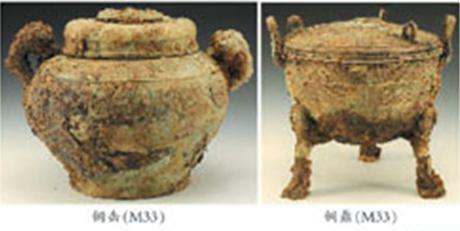 It is the first time that a series of Zeng state tombs (mid-late Spring and Autumn Period) have been scientifically and completely unearthed; first time that the “亚”-shaped burial has been discovered in Suizhou and even Hubei province; produced many bronze wares inscribed with “zeng”, contributing greatly to the identification of the state and tomb owners. It is also the first time that pits of chariots and horses of Zeng State have been discovered. Three pits are already cleared which are either two-horsed or four-horsed. Together, they provided significant material evidence for the custom of horse and chariot burial in Zeng State in the Spring and Autumn Period.